It appears filming for Fast And The Furious 9 is about to hit the open road, set to start as of next month. 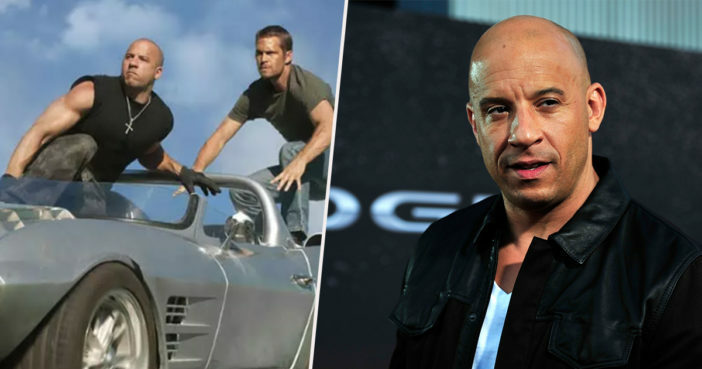 This explosive announcement was made by Vin Diesel, who plays criminal-turned-street racer Dominic Toretto in the hit franchise. Diesel posted a video on his Instagram account, revealing how filming for the famously speedy car movie will kick off in February, with production taking place in London. Crew heads out to London next month for the next chapter…#FAST9. The vid shows Diesel hanging out with Michelle Rodriguez, who plays his wife and fellow street racer, Leticia ‘Letty’ Ortiz in the action movie series. I and my partner in crime want to say a message to Venezuela, from Dom and Letty. We are with you always, y pa’lante con fe. Rodriguez can be seen standing behind Diesel wearing a hooded jacket, blowing kisses at the camera and making heart shaped gestures. All over Instagram, metaphorical tyres screeched to a halt as fans rushed to fill Diesel’s comment section with the petrol of excitement. There were applauding hands emojis and heart eyes abound, however some fans managed to calm down long enough to construct actual sentences. Although, it’s anticipated many of the core cast members will be reuniting once more, it’s still unclear whether or not Dwayne ‘The Rock’ Johnson and Jason Statham will be reprising their roles. The action hero pair are currently set to star in their own spinoff movie, Hobbs And Shaw, which is scheduled for release July 26, 2019. The plot of the ninth instalment in the gas guzzling series is as of yet unknown, with screenwriter Daniel Casey (Drag Me to Hell) taking the pen from long-time chief writer Chris Morgan. Veteran director Justin Lin is back at the wheel, having previously directed mega hits The Fast and the Furious: Tokyo Drift, Fast & Furious, Fast & Furious 5 and Fast & Furious 6. If there’s one person who knows what fast and furious is, it’s this guy. Fast and furious 9 is on the way!!!! It seems there’s still a little gas left in this franchise, which hasn’t so much as hit the brake pedal since the original, The Fast and The Furious was released in 2001. Fast and Furious 10 is scheduled to be released in 2021, marking the final instalment. Fast & Furious 9 is set to hit cinemas April 10, 2020.